102 MMS October 2017 mmsonline.com BETTER PRODUCTION Shops Using Technology time, requiring four or five clampings, additional handwork and sanding. Now, the parts are held with Mitee-Bite clamps on a pallet system and machined four at a time on the VF-2 VMCs with TR210 rotar y tables. Multiple clampings and secondary operations have been eliminated. The increased production has put the shop months ahead in shipping, Mr. Nutter says. The ST-20 lathe and bar feeder enabled the shop to also increase production on another woodworking tool: its corner chisels. 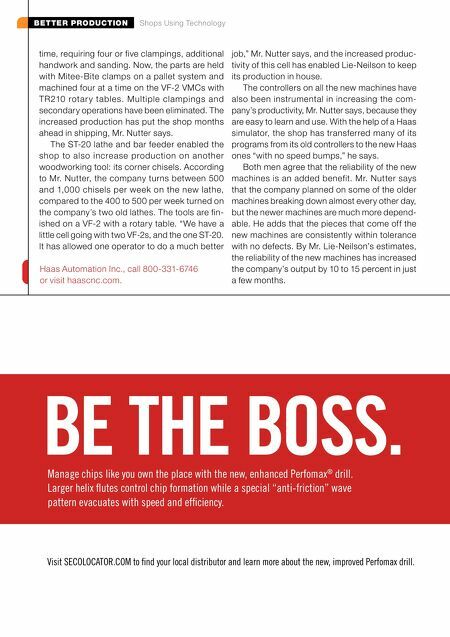 According to Mr. Nutter, the company turns between 500 and 1,000 chisels per week on the new lathe, compared to the 400 to 500 per week turned on the company's two old lathes. The tools are fin- ished on a VF-2 with a rotary table. "We have a little cell going with two VF-2s, and the one ST-20. It has allowed one operator to do a much better job," Mr. Nutter says, and the increased produc- tivity of this cell has enabled Lie-Neilson to keep its production in house. The controllers on all the new machines have also been instrumental in increasing the com- pany's productivity, Mr. Nutter says, because they are easy to learn and use. With the help of a Haas simulator, the shop has transferred many of its programs from its old controllers to the new Haas ones "with no speed bumps," he says. Both men agree that the reliability of the new machines is an added benefit. Mr. Nutter says that the company planned on some of the older machines breaking down almost every other day, but the newer machines are much more depend- able. He adds that the pieces that come off the new machines are consistently within tolerance with no defects. By Mr. Lie-Neilson's estimates, the reliability of the new machines has increased the company's output by 10 to 15 percent in just a few months. 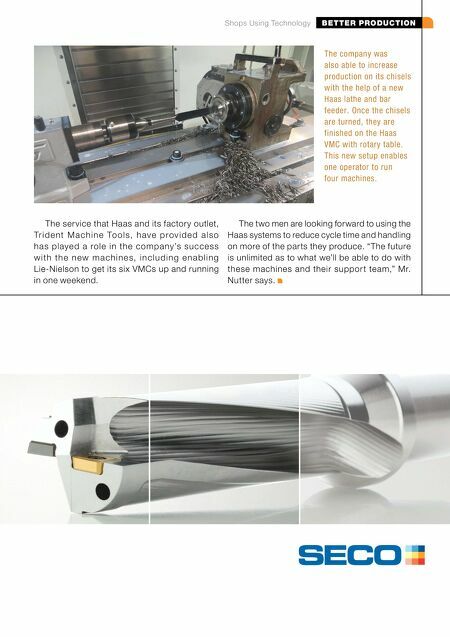 Haas Automation Inc., call 800-331-6746 or visit haascnc.com. BE THE BOSS. Manage chips like you own the place with the new, enhanced Perfomax ® drill. Larger helix fl utes control chip formation while a special "anti-friction" wave pattern evacuates with speed and effi ciency. Visit SECOLOCATOR.COM to fi nd your local distributor and learn more about the new, improved Perfomax drill.